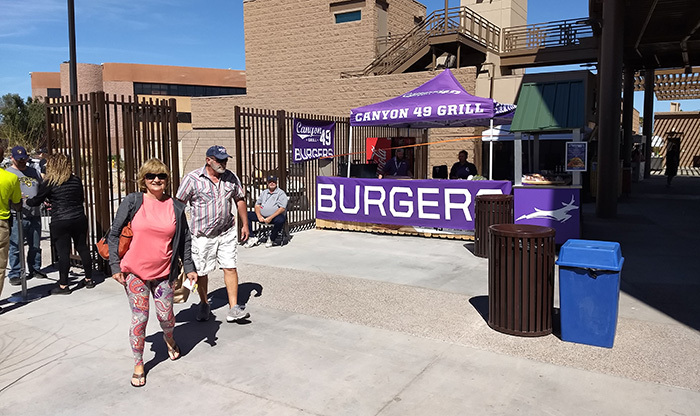 The Canyon 49 Grill concession stand sits right by the main gates into the ballpark. Grand Canyon University senior Andre Vasquez started out two years ago filling the ketchup bottles at the Milwaukee Brewers’ complex in Maryvale. Now he has mustered a lot more responsibility. 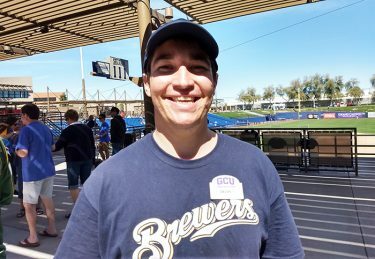 Vasquez is just one of the more than 100 GCU students – many from the Hospitality Management program, others from a variety of other majors – who make up about 80 percent of the concession staff for the Brewers’ home games in spring training. The students actually are working for Delaware North, which manages the concessions at Maryvale and many other facilities around the country. That’s how Vasquez was able to work at Qualcomm Stadium in San Diego the last two summers, and he’s not the only GCU student to go down that path. “We’ve had a lot of Grand Canyon students go to other Delaware North properties,” said Jordan Burke, the on-site manager at Maryvale for Delaware North. “We’ve also had a couple of people begin our internship program as well. It also demonstrates how the Sports Business program intersects with Hospitality Management. “The GCU relationship with the Brewers is a great example of our students having amazing access to learn and experience in an applied, real-world setting. We have our Colangelo College of Business students all over the Valley involved with the Cactus League, learning hands-on in working with Major League Baseball teams – no better place to combine Sports Business and Hospitality Management,” CCOB Dean Dr. Randy Gibb said. Stroll around the ballpark with Brett Cortright, who instills strong customer service ideals into the hospitality program he manages for the University, and you quickly see how the GCU students stand out. “There’s a major difference between the people who succeed in this business and the people who don’t, and the only difference is they care,” he said. “The people who care, the people want to do a great job, do. From left, Hannah Cervi, Karlyn Richard and Danielle Wahlmeier enjoy working together in the Canyon 49 Grill. But the students still need to be molded, and Cortright makes sure they get on-the-job training that brings out the best in them – or, in the case of junior Karlyn Richard, the zest. Richard grew up in Hawaii, on Oahu, and thought she would stay in the islands for college. But then she heard about GCU from a recruiter and decided it was better option, sight unseen, because of the hospitality program. The first time she had ever been on the mainland was when she flew to Phoenix to start classes. But that wasn’t the only complication. “I was super shy,” she said. When her initial role at Grand Canyon University Hotel required little interaction with customers, Cortright was determined to change that. He made her a bellhop, regularly having to chat up guests, and suddenly that shyness became old baggage. Working at the Canyon 49 Grill concession stand at Maryvale has given her another chance to show off her people skills. 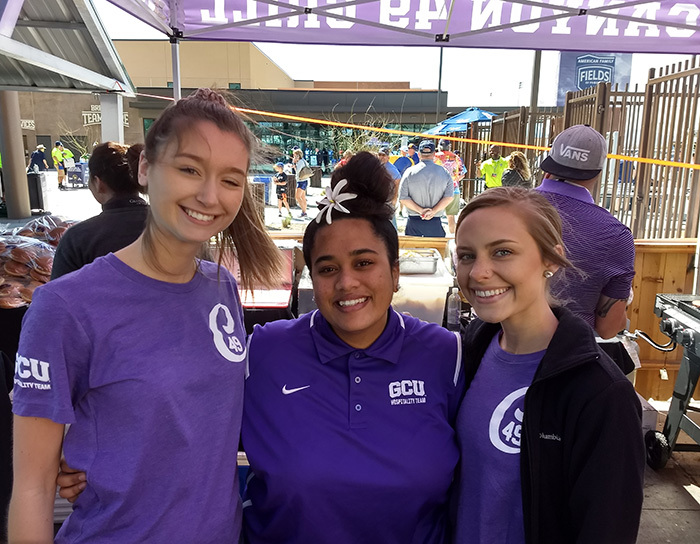 She is flanked at the Canyon 49 stand by two non-hospitality majors, freshman Hannah Cervi (elementary education) and junior Danielle Wahlmeier (psychology). It is Cervi’s second week on the job, Wahlmeier’s second day. They can’t believe their good fortune. And they get to root for their favorite teams. Cervi is from San Diego and pulls for the Padres, who are the visiting team on this day. Wahlmeier is from Colorado and roots for the Rockies, set to visit Maryvale a day later. Devon Mitchell just loves being at the ballpark. No one roots harder than sophomore Devon Mitchell, a sports management major working on the other side of the ballpark. He grew up on a baseball field and has spent years as an umpire, scorekeeper and the like. He couldn’t wait to get in the Maryvale lineup. Mitchell started out as concessions cashier and now manages inventory going out and money coming in. He credits the Management 420 class, taught by Dr. Moronke Oke, for properly preparing him for this role. Delaware North also sees to the students’ academic needs. Mitchell needs to leave the ballpark right in the middle of the game to take an exam, and that simply is part of the schedule. “They make sure I’m fed and well prepared,” he said. And that’s what this experience is all about – preparation. As the number of GCU students at the ballpark has grown (it was only 10 or so not that long ago, Burke said), so has the responsibility. As long as they pour themselves into the task at hand.